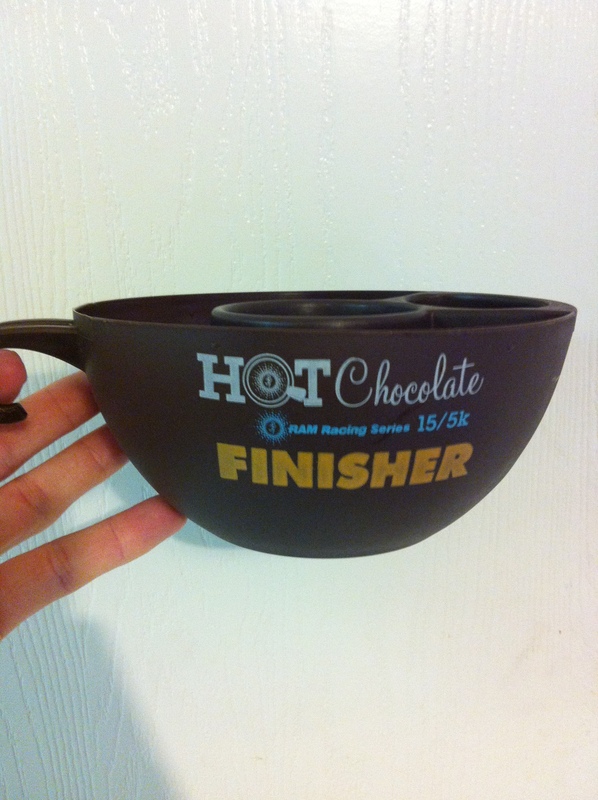 Today was the Hot Chocolate 15K, my first 15K of the 2013. My week leading up to this race has been interesting. I’m on call at work, which means I work a crazy schedule from 9-2 in the office, then 6-11 from home. If you know me at all, you know I DO NOT stay up till 11pm. LOL. This totally threw my sleep schedule and honestly I’m worn out. Friday the 8th I worked till 11pm then got up at 5am Saturday to work for an hour, then leave for the race. I left late, traffic was horrible(worst I’ve ever seen for a race) but I made it! WOO HOO! I was trying to stay out of the wind as it was low 40’s and a tad windy. I look up to see this girl running at me yelling about wearing a trash bag. She insisted on taking our picture together. I thought it was funny so we did it. 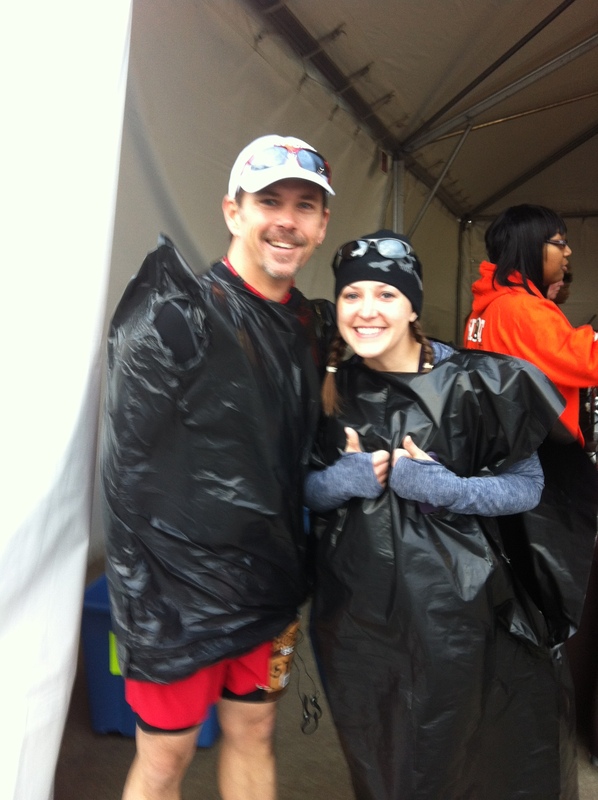 I’ve learned that the trash bag is an awesome way to stay warm before a race and then tear it off after I warm up. Usually between miles 1-2. I always take a before pic so ofcourse I did it today as well before finding my friend David. I find my friend David and we load into corral J to begin the journey of 15K. Fairly large event, lots of people so it was a slow start. Nothing major happened in the first three miles or so. Miles 1-3 were 9:24, 9:13 and 9:15 respectively. Most of these miles were slightly up hill. 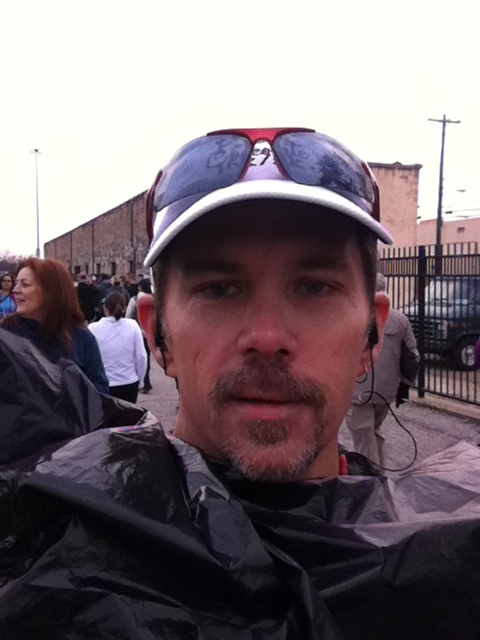 This was the most scenic part of the race as we ran down Swiss Ave in Dallas, great street for a run! Miles 4 and 5 were 9:06, 9:40. This was the big ole hill part of the race. Slowed way down to not kill myself up this hill then slowed to a walk near the top. I have been testing some new fuel called Island Boost and I recommend! I took a fuel shot as did David at the top of this hill. I knew it was mostly downhill from there so I opened up the stride and started pushing a little more. Miles 8, 9 and remaining were 8:50, 8:33 and 8:29. Really from mile 6 I felt I had to watch every step I took due to rough running surface. Nothing special about these miles, there brought us back to the fair grounds were we had to run past, between and against everybody who was already leaving the race site. That was sort of odd I thought. I mean, they were not in the way, just odd to have to dodge runners who had finished already. I waited for David to finish, but I had to get home because of being oncall for work….still. I am most proud of my heart rate during the run today. Average was 165 bpm and I’ll take that ANY DAY! I didn’t push for a PR, I didn’t push for anything other than a good solid run and THAT is what I got. LOVE IT when that happens! 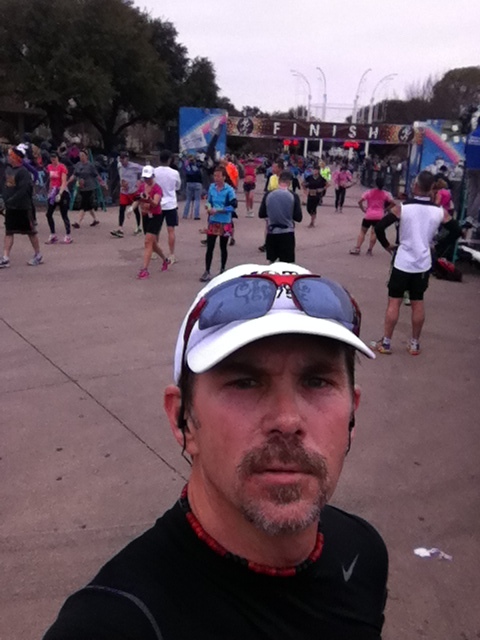 I took this post run picture moments after finishing, not sure why I was so serious, lol. This race is famous for their chocolate. So we all got this plastic mug with Hot Chocolate and melted chocolate with ‘stuff’ to dip in it. We also got a tech sweatshirt(whatever that means). Over all, I am absolutely thrilled with my run today! !